The massive disparity separating Urban and Rural communities continues to expand. The Mid West Region represents an area spanning 8,248 km², taking in the geographical borders of the combined counties of Clare, Limerick, & North Tipperary. The population of these 3 areas, according to the most recent information taken on Census night 2016, are officially recorded as:- Co. Clare – 118,627 persons, Limerick – 195,175 persons (Inc. Limerick city) and North Tipperary – 71,370 persons. Total population for the Mid West Region can therefore be calculated as containing some 385,172 residents. The Siren Study set up to evaluate the development and performance of different emergency and urgent care systems (EUCS) has show that medical patient survival rates for emergency cases, in this same Mid West Region, are among the lowest in the country. The findings of this study undertaken by University Collage Cork (UCC), which compared patient admission and outcome figures for 2000-2006 and 2007-2012, suggested that if every County had the same death rate for emergency conditions as Dublin, up to one thousand lives per year could be saved. While admitting that fatality rates have dropped nationally during the past 10 years, the disparity still remaining between the regions continues to dwell significant. Dublin currently has six emergency departments for a population of 1.2 million people. If the same A&E model was in place in the Mid West Region were to be used in Dublin there would only be three emergency departments available in our capital. The excessive waiting times for ambulances and the requirement for all emergency cases to be taken to University Hospital Limerick (UHL) is acknowledged as having been a likely cause of death in a number of past emergency medical cases. The original reasoning behind the development of a ‘Centre of Excellence’ in Limerick certainly showed some merit, as in the centralising of certain expertise and services. However based on the current demand for services alone, (UHL) at this present time is not ‘fit for need’, and to-date has not been sufficiently upgraded in the aftermath of the initial decision to downgrade Nenagh General Hospital. Based on projected population increases alone the people of North Tipperary, in particular, continue to allow themselves to be treated as second-class citizens. Promises made to provide a new accident and emergency (A&E) department at University Hospital Limerick following the downgrading of both Ennis and Nenagh General Hospitals has now been delayed by a further two months according to confirmation by the UL Hospitals Group recently. Their excuse “It is more important to get it right than to open too soon without the proper systems and safeguards in place”, is no longer acceptable. Building contractors, engaged at University Hospital Limerick, are due to hand over this new project at the end of the first quarter in 2017, and between 90 and 100 additional staff are being targeted for the new department, in a recruitment drive that is supposedly currently under way. The Irish Nurses and Midwives Organisation (INMO) however have expressed concerns over the likelihood of securing such medical staff in the immediate future. Not for the first time over the last few months and in the case of UHL, yesterday showed same to be the busiest A&E in Ireland, with 36 patients reported as waiting to be provided with the luxury of a bed on a ward. To add further to this misery; fears have been expressed over the continued provision of the essential rapid response emergency ambulance services for Tipperary and Clare. The National Ambulance Service (NAS) have confirmed they are reviewing the provision of rapid response vehicles in both counties with a view to discontinuing at least some already existing services. 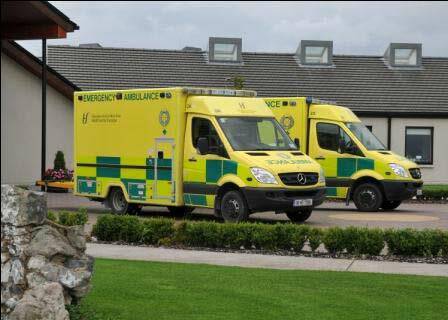 Back in 2009, as part of a HSE reconfiguration of hospital services, which supervised the closure of Nenagh’s A&E departments to a daytime only operation; ambulances staffed by advanced paramedic staff, specially trained in advanced life support skills and drugs administration were introduced into the Mid-West instead. This same service was touted by the HSE as ‘Tipperary’s A&E on the Road’. We were informed then, and foolishly accepted as fact, that this service was to be “A natural progression in the enhancement and development of the ambulance service in North Tipperary”. While the HSE confirm that this review has only recently commenced and that no decision will be made until all aspects of the Mid West Review is finalised; North Tipperary needs to be aware. After all just some weeks ago our County Councillors were discussing raising Property Tax in Co Tipperary. Perhaps it’s now time to sell up or accept the fact that you will die, not as a result of any medical condition such as a heart attack, but as a result of remaining to reside in a long forgotten rural North Tipperary. Totally agree with your analysis. Seems strange that after closing all the local facilities and centralising the out of hours doctor service, the powers that be, forgot or neglected to deal with the obvious surge of patients that would arrive at A&E for admittance.